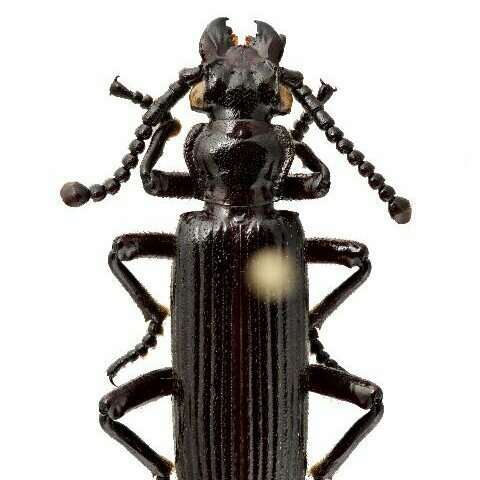 Ozaena ground beetles likely have anatomical adaptations enabling them to parasitize ant nests throughout their life cycle, according to a study published January 16, 2019 in the open-access journal PLOS ONE by Wendy Moore from the University of Arizona, USA, and colleagues. Some ground beetles in the genus Paussus ("ant nest beetles") are known to live in ant nests and parasitize ant societies for their entire life cycle, for example secreting chemicals as larvae to attract ant prey. However, ground beetles in the genus Ozaena were previously thought to be free-living, with larvae digging burrows to ambush their prey. The authors of the present study examined ground beetles of the species Ozaena lemoulti, using adults collected from the Parajito Mountains of Arizona, eggs from previously-preserved adult females, and hand-reared larvae. They examined the beetles' anatomy in all three life stages and molecularly-sequenced adult beetle gut contents to confirm food sources, hoping to find clues to the species' lifestyle and behaviors. They also compared O. lemoulti to the closely-related Goniotropis beetle, which is known to be a free-living, burrow-digging predator. The authors found anatomical features which might indicate that O. lemoulti parasitizes ant nests throughout its lifecycle, unlike other Ozaena beetles. Compared with Goniotropis larvae, O. lemouti larvae have morphological modifications to their mouthparts, head and abdomen which indicate that they are free-living mobile hunters in ant nests instead of immobile burrow-dwellers. The eggs lack the spongy air layer which in Goniotropis eggs protects against extreme weather conditions, indicating that they may be laid directly in the protected conditions of the ant nest. The gut sampling of O. lemoulti adults revealed that these beetles appear to exclusively feed on ant fluids, unlike Goniotropis adults. While previous studies have indicated a possible link between adult Ozaena and ant societies, the authors state that this is the first research to indicate that an Ozaena species might exploit ants throughout its life cycle. Further research might use larger sample sizes and observe more directly the behavior of the beetles. Nonetheless, the authors believe that their research strongly indicates that O. lemoulti beetles, independently of the Paussus ant nest beetles, have adopted a lifestyle exploiting the rich food supply and safety found in ant nests. The authors add: "DNA sequencing of gut contents and comparative anatomy of three life history stages reveals that Flanged Bombardier Beetles in the genus Ozaena have adopted a new, obligate nest parasite strategy for living with and exploiting ants as their sole source of food. Unique morphological modifications of the head and abdomen indicate that Ozaena larvae do not live in burrows but rather are free-living, mobile hunters. We hypothesize that the main motivation to leave the burrow is the opportunity that affords the larva to feed on non-mobile food, specifically ant brood, the most treasured, soft, protein rich, and fat rich resource in the nests."